The dough - mix the dry ingredients (flour, yeast, sugar, salt and zest) add the wet ingredients (eggs, butter, brandy and 200 ml milk), start to knead while adding the rest of the 200 ml milk until the dough is smooth and soft (around 5-7 minutes). 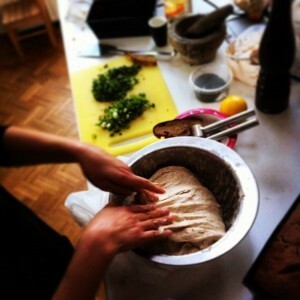 Place the dough in an oiled bowl, wrap it with a plastic folie and let rise until double in size (1-2 hours). Oil 2-3 baking papers and lay them on trays. Place a vessel filled with sunflower oil and a brush next to the trays. Take out the dough and lay it on a floured surface, punch the air out of it. Now, either use a scale to measure each unit or divide the dough to 3 equal parts, each part to 10 equal smaller parts (now you have 30 units). Roll each unit into a ball and place it on the oiled baking papers, brush each one of the balls with the sunflower oil so they won’t get dry. Place each ball at a 3 cm distance from another ball . Finish with the rolling and let the balls rise until they bounce softly back (15-20 minutes). In the meantime, place a wide and deep cooking pan on the fire, get it to 180C (use a deep fry thermometer, if you don’t have one there are some ways to check the temperature*), when the dough has risen - delicately move each ball into the pan (do not over crowd it, make sure there is enough space between the balls, they will continue to rise), give each side of the ball 1-2 minutes until it reaches golden-brown shade. 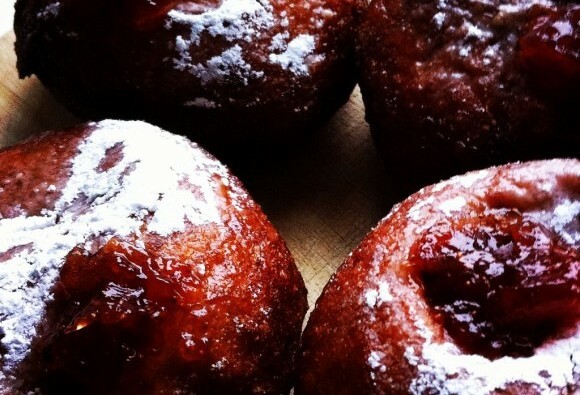 Take out the baked Sufganiyot and place them on a paper towel, let them cool off a bit. Warm up the filling (using a microwave or Bain-Marie) and using a syringe - inject the filling into the Sufganiyot. Sprinkle powdered sugar and serve. * How to check when the oil reaches a 180C temperature ? 1. Drop a corn kernel into the oil, once it pops into a popcorn - the temperature is right (just don’t forget to take it out). - If nothing happens - it’s not hot enough. - If it fizzles with lots of bubbles - too hot! Lower the flame. - If there are some bubbles coming around the handle - it’s the correct temperature.